After a season in which Arsene Wenger spent much time telling the press, the fans and indeed his own players that they were good enough, the past few weeks have shown that they are not. The Champions League semi finals saw them completely outplayed by Man Utd in the first leg but somehow get away with just a 1-0 defeat. All the talk was of a majestic comeback in the second leg where they could score two goals with no trouble and keep the clean sheet that would get them through. That talk lasted all of about 7 minutes before Ji Sung Park scored after a defensive mistake. Not impossible you thought, Arsenal are more than capable of scoring three goals and they still have 80 odd minutes to do it in. Wrong. Four minutes later, Ronaldo won a cheap free kick 40 yards out, blasted it at goal, Almunia did one of his infuriating camera dives where he doesn’t actually dive properly and just flops instead, and suddenly it’s 2-0 Man Utd and the tie is dead. The rest of the game was a lesson in how to control a game. Arsenal couldn’t get anywhere near Man Utd, with only a debatable penalty to show for their efforts, having already conceded another. This was followed by the biggest home defeat in years last weekend, Chelsea destroying them 4-1 at the Emirates. If anything this match brought home even greater truths as for much of the first half Arsenal were the better side but as has been usual over the Wenger era, missed a hatful of chances before succumbing to a well flighted free kick that Alex headed in. Anelka, Toure (og) and Malouda all added goals which could have been prevented by a proper defence. Some semblance of pride was salvaged with a creditable 0-0 draw yesterday against United but the game mattered little. As frustrated as we are. I have never seen Wenger so down after a game as he was after that second leg. Most of his answers were one or two words and he was visibly upset at what had happened that night. We saw for the first time some admission that attempting to build a team completely with young players may not be the best way to go. He acknowledged that in the games that mattered there was something lacking, and that some ‘distance’ would be needed to assess what changes were required at the end of the season. The January signing of Russian superstar Andrey Arshavin showed what playing for ready-made quality can do. He has been a revelation, seamlessly slotting in despite being played out of position and has yet to taste defeat. I do admire the fact Wenger is trying to win it all with kids but I feel at some point he lost track of the fact that for young players to improve, they need older players to learn from. When we previewed the semi finals last month, it was noted that from the side which reached the Champions League final in 2006, only three players remained. Campbell, Lehmann, Flamini, Hleb, Cole, Henry, Pires, Reyes, Ljungberg, and Gilberto all gone. The number of players released or sold on has been phenomenal and it seems as if even late 20s is now too old let alone thirties. Last summer, Hleb, Flamini and Gilberto left. That was half the first choice midfield and a World Cup winner. Only Nasri and Ramsey came in (I refuse to count Silvestre as a replacement for anyone). The belief that by signing a top midfielder like Alonso you would be ‘killing’ Diaby, Song and Denilson is misguided. I would say that it’s actually the opposite. By not signing him, they have no one to push them in training, no one to push their automatic place in the first team, no one who can tell them what it takes to win major trophies. I realise that a lot of improvement is done by playing first team football against top opposition, but at the same time that goes hand in hand with improvement on the training pitch, something Wenger is an expert at. If you have no competition within your colleagues, you’re less likely to try harder and subsequently get found out when playing against the big clubs in league and Europe. Compare Man Utd’s central options to Arsenal’s. Fergie can pick from Anderson (21), Carrick (27), Hargreaves (28), Scholes (34) and Fletcher (25). Throw in Giggs and Gibson and you have a nice blend of youth and experience which has seen the previously unheralded Fletcher improve to an extent where he is a first choice pick. In north London you have Fabregas as the senior figure at the grand age of 22. He is joined by Denilson (21), Diaby (23), Song (21), Ramsey (18) and a few others. All very young and inexperienced, despite many already being internationals. Not the new Cesc, and not the new Vieira. Take for example Alex Song. He is someone who has actually become pretty good this season (though considering how poor he was, any improvement would have been significant) but surely if you’re a developing defensive midfielder, it would be quite useful to have some like Gilberto around to give you handy pointers. Brazil perhaps aren’t noted for their defensive players but at the same time you don’t win a World Cup if you’re rubbish (though I suppose Roque Junior was in that squad too). Anyway the point is that Song could have learnt from him and if good enough over the course of the season, usurped him on merit. The ideal turnover is a young player replacing an older one over the course of the season and then you can get rid of the older player in the summer. You can’t dump a bunch of experience and go into a campaign blind and hope that a youngster proves himself – the Fabregas’ of this world are the exception not the rule. You'll get found out against the best. Also, I don’t see how it’s one rule for the midfielders and one rule for the attackers. Why can the chances of Diaby, Denilson and Song not be harmed by signing an experienced central player but signing Arshavin doesn’t block the young wingers/strikers. Is it not suddenly infinitely more difficult for the likes of Bendtner, Vela and others to grab one of the four wide/striking slots? He has always been very clinical in getting rid of players he feels can no longer offer anything and to be fair you can count on one hand the players who have more success once leaving the Gunners. Here’s hoping the underachievement (or playing to their level depending on your viewpoint) of this season’s squad means Wenger ends his policy of youth only and realises it’s time to be clinical with some of the current players too. I feel Arsenal are not far off challenging properly and the signing of a quality centre back and defensive midfielder would go a long way. The likes of Denilson can still become good players, but not without a helping hand. Ultimately, Wenger’s priority should be the welfare of Arsenal Football Club not individual players and this summer will be the time to re-address that. All good players in their own right and all will probably help Spurs avoid relegation and climb up to mid table. But what strikes me once again is the short sightedness of their transfer dealings. There is the bizarre scenario of Keane and Chimbonda rejoining a club they only left six months ago, while Defoe was only gone for a year. Redknapp seems determined to rebuild much of the squad that were a dodgy lasagna away from Champions League qualification under Martin Jol in 2005/06 and not too far off in 06/07. The problem with this idea is that he has no chance of getting Michael Carrick or Dimitar Berbatov from Man Utd and they were the respective heartbeats of those sides. There’s a reason Fergie signed those two and not say, Jenas and Keane. We talked recently about how signing Keane is a very odd move after signing Defoe. Defoe left Spurs the first time round as he wasn’t getting games due to Keane and Berbatov being first choice. As a partnership him and Keane never worked and as captain Keane would always play. I can understand that in light of Defoe’s ten week injury it made sense to sign someone but given that they were linked with the likes of Kenwyn Jones and Fred, it seems odd they plumped for Keane. What happens when Defoe is fit? Does Keane, who has been made captain again, get dropped? Does Defoe? If ‘Arry does try and play them together where does that leave £16.5million Modric? You can’t play all three of them at once (well you can, but you’d have a very small, unbalanced side). Bent, Bentley and Pavlyuchenko weren’t exactly cheap either. Redknapp insists they can play together but I’ll believe that when I see it. Why was David Bentley signed last summer when Aaron Lennon was on the books? There’s only one spot on the right and neither are good on the left where there is an actual need. Why was Darren Bent signed in 2007, at a time when Spurs still had Keane, Berbatov and Defoe? How did they think that all four could be kept happy? Why was a good defensive midfielder never signed in the last few years? There is a lack of cohesion over how transfers should be approached. On the one hand, Spurs have adopted Arsenal’s policy of buying up lots of young players to sell later. They have spent a lot of money on the likes of Bale, Hutton, Dos Santos, Boateng and many, many more. No one has really been a success yet and it just shows how well Wenger did in plucking Vieira, Fabregas, Clichy etc from the rest. They also tried and failed with the continental approach, ex director of football Damien Comolli being responsible for many of the strange deals we have mentioned. Part of the problem has been the regular change of manager. 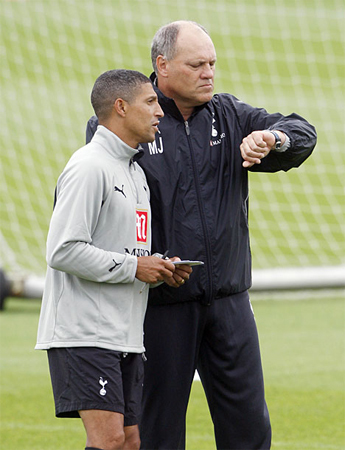 Jol brought two consecutive fifth place finishes (their best since 3rd in 1989/90) but was sacked in October 2007 after a poor start. This saw Juande Ramos come which in theory was a good idea (he was quality at Sevilla) but for whatever reason he failed. This was not before dismantling much of the squad that came fifth. I’ve always said that Daniel Levy & ENIC are in a rush to sell Spurs, just as soon as they can market them as a side in the Champions League. The problems with this is that he panics and doesn’t give his managers time to put things right whenever a poor start is made. Thus a vicious cycle is created where, old manager is sacked, new guy comes in with his own ideas and players he wants, new manager then also fails and is sacked, newer guy comes in. And so on and so forth. We’ll never know if Jol would have turned it round in 2007/08 but I sincerely doubt they’d be in the mess they are now had they stuck with him. Sometimes it takes time but if you back someone they often come good. Martin O’Neill only came 11th in his first season at Villa but now they look like they’ll qualify for the Champions League. David Moyes has had two bottom half finishes in his time at Everton (including a 17th) but has now finally made them a regular top six side. Both have overtaken Spurs as clubs more likely to break into the top four. There’s a lot to be said for stability off the pitch and hard work off it. For too long Spurs have had neither hence their current struggles in the lower echelons of the Premier League. While watching ITV’s decidedly average coverage of the FA Cup tie between Preston and Liverpool, Sam Allardyce mentioned how it’s harder for young English players to break through (with reference to Neil Mellor) as clubs are filling their academies with foreigners. He cited Arsene Wenger as a prime exponent. Now whilst I’ll be the first to admit that Wenger has signed/poached/found down the back of the sofa many a youngster from abroad, the implication seemed to be that *yawn* he doesn’t give English players a chance. There is plenty of evidence to suggest otherwise. 1. Current Ex-Arsenal youth players in the Premier League. All English and all given chances by Wenger, but for various reasons never made the grade. Obviously some were signed at from other clubs at 16/17 but it’s fair to say their main education came at Arsenal. Add to this several players like James Harper in the Championship (Mellor’s current level) and you have lots of guys who simply had better players ahead of them at the time. 2. Current English players at Arsenal (who’ve played this season). Many of those have received their opportunities in the Carling Cup but about half have played in the league or Europe. It’s unclear who will make it beyond Walcott and Wilshere but it again shows that if good enough you are given a chance. 3. The standard at the Big Four clubs is higher. Big Sam can moan all he want but ultimately it will always be tougher to make it at the likes of Liverpool and Arsenal than Bolton and Blackburn. Wenger and Benitex didn’t get where they are by worrying about nationality, it is always about quality. Their job is to worry about how their club is doing, not England. It is not unfair to say that give the size and number of players, England have underachieved internationally. Could it possibly be because many players just aren’t that good? Allardyce is also a bit of a hypocrite in this whole issue as he has also been quite happy to play 11 foreign players in his Bolton team rather than give an English youngster a shot. It seems he does realise the same thing as the top boys. Hey, Rafa why is Big Sam picking on me? 4. Allardyce and Wenger don’t particularly like each other. This point is on a slight tangent, but Allardyce and Wenger have never been the best of friends. Wenger never liked the fact Bolton would beat Arsenal playing physical, direct football while Allardyce felt he didn’t get the credit he deserved. There has been many a bitchy comment in the past and I wouldn’t be surprised if this was a another small dig. In conclusion, Allardyce fires another cheap shot that fits in perfectly with the lazy journalism of ITV. Wenger has perhaps bought/played foreigners ahead of English players in the past but it is unfair to say he never gave chances. Also, why should he persist with someone who breaks curfews, punches people and drink drives and lies about who he is (step forward Mr Pennant) just because he is English? In a word Big Sam, shut it. 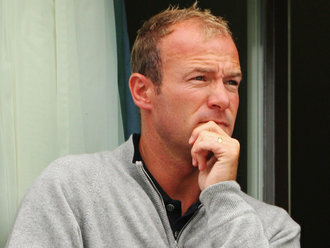 Alan Shearer says he wants to get into management, but when will he finally do so? 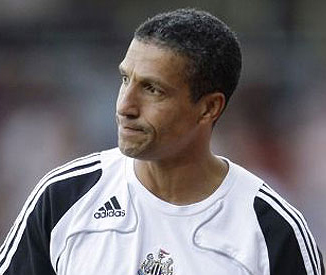 Last Friday’s latest revelation that he has turned down an opportunity to do some coaching work at Newcastle made me wonder is he ever actually going make the leap. He seems to be waiting for some kind of perfect scenario where Newcastle are a stable club, in the top six or thereabouts and with money to spend. This is simply not going to happen. If Newcastle were ever to reach that position in the next five years it is unlikely they would then take a risk on someone whose managerial credentials stretch as far as “Well I know the club inside out”. Since Bobby Robson was stupidly sacked at the start of the 2004/05 season, Newcastle United have had five managers – Souness, Roeder, Allardyce, Keegan and now Kinnear. 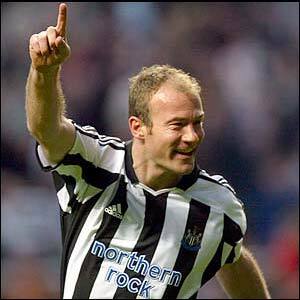 I reckon that Shearer has been linked to the job each time but has always said he’s not ready. He’s scared more like, scared that it might not all go swimmingly. I would have much more respect for him if he took the job now and built Newcastle back up to the title challengers of the mid nineties, or even into European contenders. Considering they’ve won nothing since 1969 even a League Cup would see the fans happy for about ten seasons. He is in the enviable position where he doesn’t even need to apply, or doesn’t feel the need to. It’s always “Well if they’re interested they can give me a call”. There have been calls Alan, so what exactly is the problem? I want the job! Me, me, me! 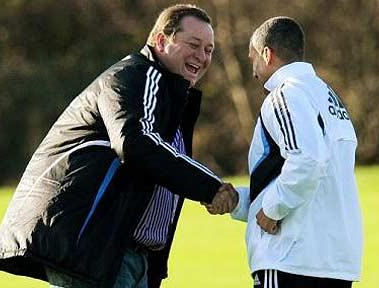 Ok, maybe he wants to wait for the right moment to go back to St. James Park, that of course is his prerogative. But why not take a job somewhere else in the mean time and get some experience? What was wrong with the Blackburn job that was basically his for the taking in the summer? A solid club where he’s well revered; a decent set of players including Santa Cruz, Pederson and McCarthy; and very low expectations. They’d be delighted with just a top half finish. He won’t even accept coaching roles, which essentially have no pressure at all and you can take a lot of credit for any success (see Carlos Queiroz and Man Utd). You could almost forgive him if he was a good pundit, but he’s not. Full of cliches, no actual opinion on anything and with the personality of a fish. I’d much rather listen to what Lee Dixon or Martin Keown have to say. Even Garth Crooks is more appealing as he at least has comedy value. 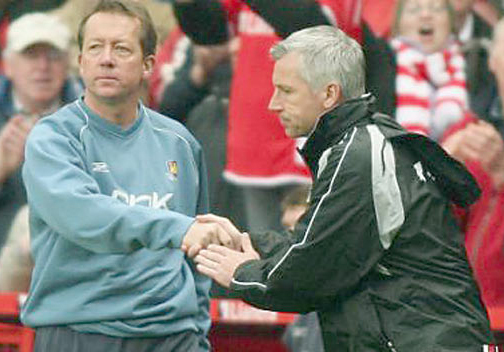 So Alan, assuming this Newcastle takeover goes through by the summer AND for some reason the new owners want you as manager, will you take the job? Or has the Match of the Day sofa become permanently attached to your rear end?